You are an accountant, right? Well, that means that you have some keen analytical skills that can be used on things other than just accounting. In my case, I use my analytical skills to gauge how successful my website is each week, and then determine whether I need to make any changes to my site to increase the desired results. For those CPAs out there, remember analytical procedures? This is a very important part of the audit process. We use our analytical skills to determine if the numbers “look right” for certain areas of the financial statements. We first have to document our expectations, and then run the analysis and compare the results to our expectations. When there are differences, we get to investigate them and document why those differences exist. Sounds kind of like budget versus actual reporting, right? So, we are accountants and possess these Analytical Skills. Why not use them in other areas of our business? I use them to gauge my website’s results and then determine if I need to make changes to my site to get better results. 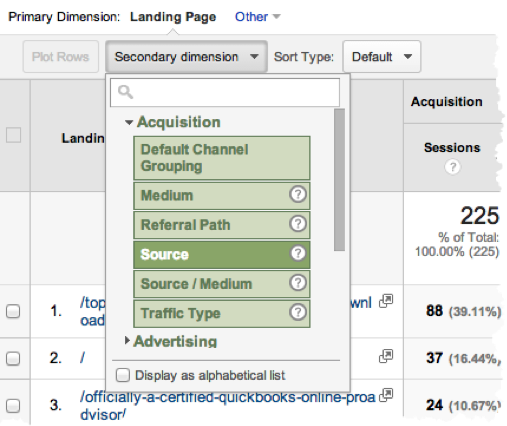 To get started, you need to set up a Google Analytics account. Then, you need to get your Google Analytics ID code and apply that to your website. Your Webmaster should be able to help you with this, or if you have a WordPress site, you can download a plugin and just enter your ID there to start tracking your results. Now it’s time to start analyzing the results. I like to do this weekly so that I can make any changes to my site quickly, as the traffic should be fairly consistent to my site from week-to-week, unless it’s the holidays or something. I analyze just 3 areas of the data provided by Google Analytics: average page views per visit, top viewed pages on the site, and top landing pages by source. Google Analytics used to provide you with a Google keyword report, but they took that away a while ago, so I have replaced that with the Top landing pages by source. I enter my results weekly into a spreadsheet and then highlight the new cells, based on whether I think the results are good (green), “ehh” (yellow) or needs improvement (red). Average Pages per Visit = You can find this on the first page after login, called the “Audience Overview.” I just pull “Sessions” as my “Total Visits” number and the “Page Views” for (you guessed it) “Page Views.” Note: I don’t use “Users” as “Total Visits” because those users might be visiting my site more than once. You divide Page Views over Total Visits and you can see, on average, how many pages your visitors are viewing on each visit. Top Viewed Pages = This is under “Behavior,” by selecting “Overview.” Here, you get the Top 10 visited pages to the site. This is usually all I track. Now, if your 11th has hundreds of visits, you might like to track more info, but I get the gist of what is going on with the Top 10. Here, I want to see if I am moving visitors to the right pages on my site and converting them to potential leads. If they are spending all their time on my blog, that is great, but I better still have some good results on my “contact” page, or else I’m not attracting the right people to my site for conversions. I learned a similar lesson ages ago when I put on an “Excel for Professionals” Webinar. I had a ton of turnout, but not the people I was trying to attract as leads for my services. The majority of the viewers were in corporate America – and a ton weren’t even connected to any part of the accounting department. ~ Lesson learned! The result is a sweet little report (in my opinion). 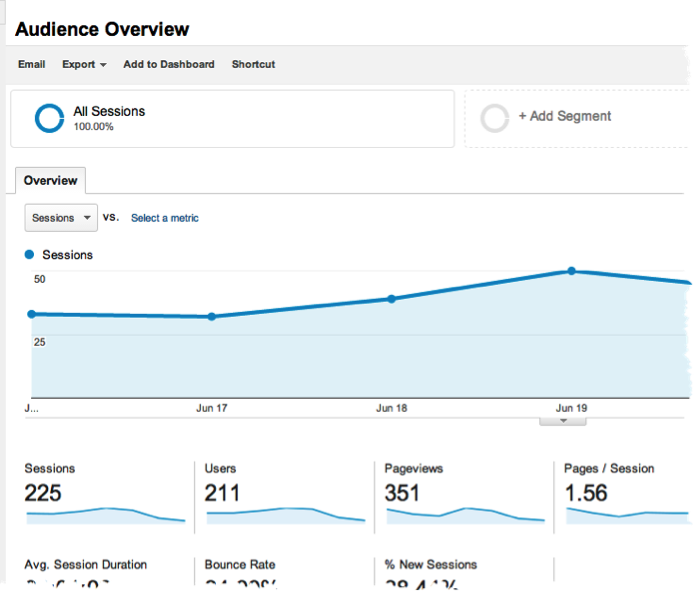 Here, you can get a sense of why people came to your site and how. 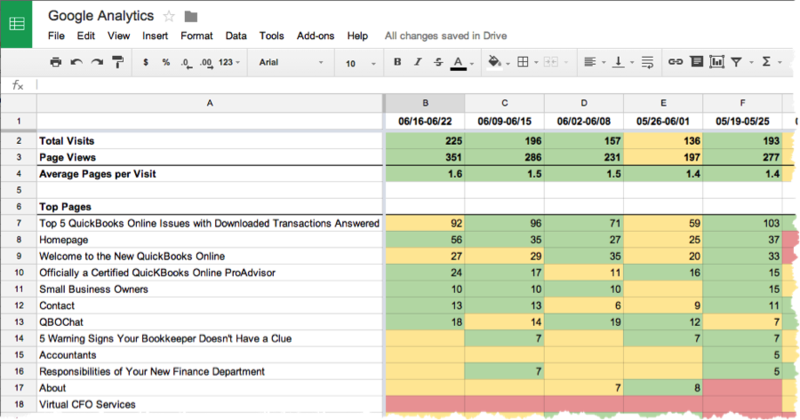 In my example below, you can see that 85 people came to my blog post on the “Top 5 QuickBooks Online Issues with Downloaded Transactions Answered” by searching on Google. That tells me what blog posts (or even pages) are performing the best at attracting users to my site. And, that’s it! Just 3 simple reports in Google Analytics gets me a ton of useful data to perform my own analytical procedures on my website. 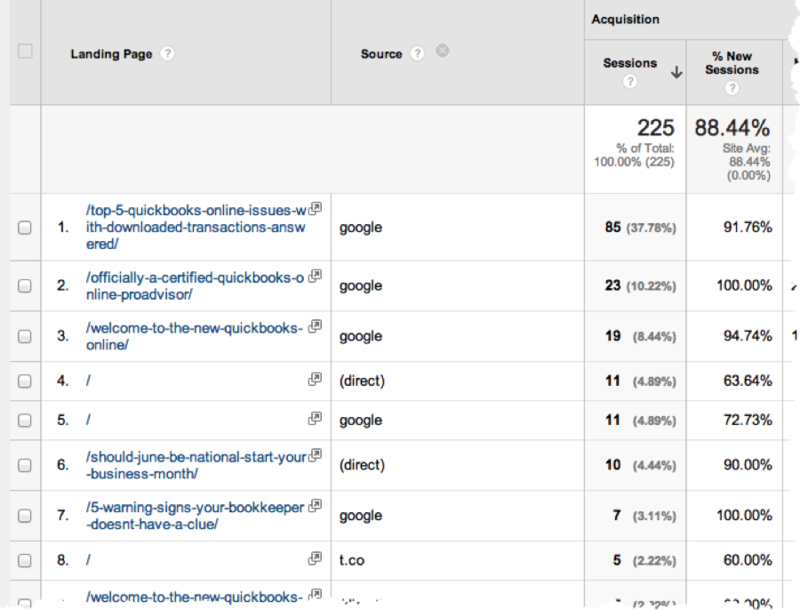 Have you ever used Google Analytics and tracked the results? I’d love to hear if there are some other reports in there that you use regularly and what information it tells you about your website. Cathy Iconis, CPA, is the CEO of Iconis Group, an outsourced bookkeeping firm, and founder of QBOchat.com, a community for QuickBooks Online Users. Iconis has brought her experience in big business finance to the small business owner. Her goal is to connect small businesses to their numbers using the best in class technology, including QuickBooks Online.